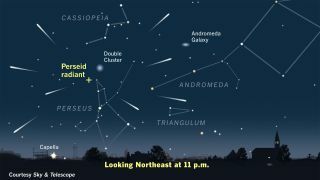 The annual performance of the Perseid meteor shower is due to reach its peak late on Sunday night (Aug. 12) into the predawn hours of Monday morning. This is the most famous of all meteor showers, and the Perseids never fail to provide an impressive display. In the Astronomical League guidebook "Observe Meteors," astronomers David Levy and Stephen Edberg wrote, "We have seen Perseids coming in such rapid succession that counting and recording were difficult, followed by slack periods with little activity." This year is an excellent one for the Perseids, because they will reach their maximum on a new moon weekend; without any bright moonlight, skywatchers will be able to see many fainter streaks. The best viewing conditions this weekend will likely be over the northern and central Great Plains as well as parts of the Midwest, where skies are expected to be generally clear. In contrast, clouds, showers and scattered thunderstorms will thwart prospective meteor watchers in a swath extending from the southern Great Plains northeast through the Carolinas, the Middle Atlantic states and on up into the so-called "Northeast Corridor," running from Washington and Baltimore to Philadelphia, New York and Boston. And in some places, a sky free from clouds will not automatically mean a good view for the meteors. Smoke from the California wildfires that now covers parts of the western U.S. may create hazy sky conditions capable of significantly dimming bright stars — and bright meteors. This is especially true for areas that are located immediately downwind of the wildfire zone. In many western locations, the word "smoke" has been appearing in recent forecasts issued by the National Weather Service. To obtain the latest updated forecast for your town or city, visit: http://www.nws.noaa.gov/organization.php. There, you will find listings for over 150 National Weather Service forecast offices in the United States, including in Puerto Rico, Guam and American Samoa. Each office provides forecasts, as well as radar and satellite imagery and other important information pertaining to weather. By profession, I'm a television meteorologist, and many people think that all meteorologists know a lot about meteors. That's not true, though, despite the similar names. The word "meteor" comes from the ancient Greeks and means "in the air." Until the 18th century, this term was also used to describe other natural phenomena, such as auroras, lightning, rain, hail, snow and clouds, which are now studied in meteorology. Meteors on the other hand originate in space, where there is virtually no air. They begin as particles that have been shed from a comet's nucleus. When these particles ram through our atmosphere at very high speeds, atmospheric friction causes them to blaze up within the space of a heartbeat. And they leave behind a very hot trail of gas, which creates the effect of a "shooting star." This all happens some 50 or 60 miles (80 or 100 kilometers) above our heads. So, while meteors are indeed "in the air," they are totally different from what your local weather forecaster looks at to put together a daily forecast! Editor's note: If you snap an awesome photo of the Perseid meteor shower that you'd like to share with Space.com and our news partners for a potential story or gallery, send images and comments to spacephotos@space.com. Joe Rao serves as an instructor and guest lecturer at New York's Hayden Planetarium. He writes about astronomy for Natural History magazine, the Farmers' Almanac and other publications, and he is also an on-camera meteorologist for Verizon FiOS1 News in New York's Lower Hudson Valley. Follow us @Spacedotcom, Facebook and Google+. Original article on Space.com.